Just hearing the word "slushy" evokes memories of a fun, kid-inspired summer, doesn't it? While we may not have three entire months off from all responsibilities, where we could spend them running through sprinklers and playing games in our backyards, adults deserve some summer slushy fun, too. Good news, grown-ups: making your own slushy is as easy as a throwback summer day. And now that our school years are behind us, adding a little alcohol to that slushy becomes an acceptable option for the 21-and-over crowd. 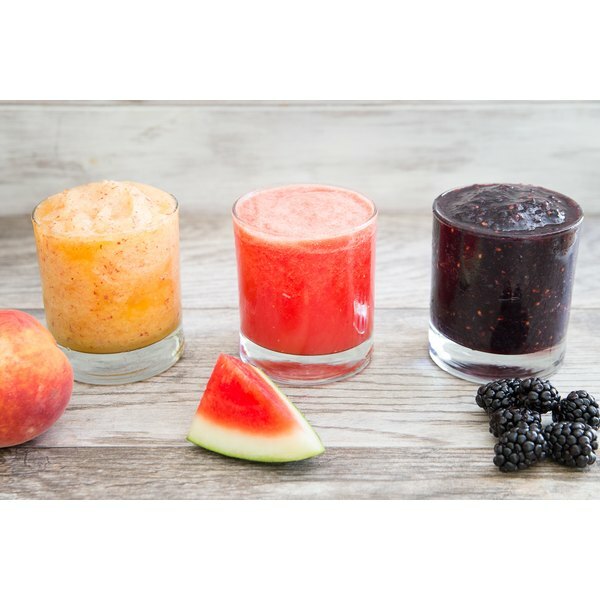 These three boozy fruit slushies — watermelon vodka, blackberry bourbon, and peach white wine — are refreshing, comforting treats that are perfect for kids at heart. The method is the same for each flavor, just throw everything into a blender for a few seconds and blend until frosty. For the watermelon vodka slushy, freeze watermelon cubes ahead of time and use less ice for an even thicker and sweeter slushy. Pour every ingredient into a blender and pulse until combined for a rich, flavorful treat! Choose a floral white wine with hints of peach, or another stone fruit, to complement the ripe summer peaches in this slushy. You can also roast the peaches first for a deeper, more robust peach flavor. Now that you've tasted all three boozy slushies, serve them at your next barbecue or family dinner. All of the adults will feel like kids again! Gina Matsoukas is the creator of "Running to the Kitchen," a blog focusing on healthy, whole food recipes with a seasonal twist. When not in the kitchen, you can find her working off all food she makes at CrossFit or with her weimaraner, Ginger.